By 2025 about 40% of Fortune-500 companies are likely to vanish due to megatrends like digitalisation. How can you save your company from disappearance and save jobs? One way is to ensure that your organization is ready for the digital age, whereby you must address your organization’s culture. State-of-the-art technology alone won’t turn you into a digital master. 1. What is organizational culture? 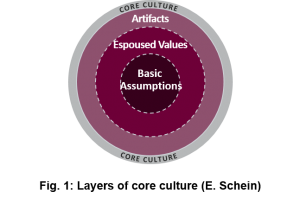 Before starting the digital culture transformation journey, the understanding of the core culture (see Fig. 1) is crucial for success. It consists of (easily alterable) visible artifacts (e.g. office design), invisible espoused values (e.g. rules) and basic assumptions (e.g., attitudes). Espoused values and basic assumptions change over time when leveraging the right triggers. 2. What is digital culture and how can we assess it? Eight specific dimensions define the digital viability of an organization’s DNA: Digital leadership, digital technology and processes, autonomous working conditions, agility, entrepreneurship, collaboration, innovation and learning, and customer orientation. The Digital Culture Assessment (DCA) highlights the well-developed dimensions and dimensions with a need for improvement. 1. What is Organizational Culture? Before we understand what digital culture is, we first need to understand corporate culture in general terms. The CEO is in charge of cultural change and must have a deep understanding of the different layers and its respective elements and meanings in order to achieve change. Many CEOs struggle with illustrating culture because there is no tangible output that an organization produces—corporate culture is just “there.” It is the company’s DNA—the way an organisation “smells” and “behaves” with visible and invisible elements. Corporate culture is the host of visible manners and rituals, named artifacts, invisible espoused values and basic assumptions, by which a company differs from its environment. Culture influences decision making, behaviour and the motivation of employees—thus, individual and company performance. But how to trigger change of your core culture? An organisation can easily change artifacts (like an office design) but it is clear that it can’t just change espoused values or basic assumptions which were around for decades; a practical approach is needed here. In the light of experience, changing the corporate parameters triggers a shift of the core culture. Therefore, changing the corporate parameters becomes a crucial precondition for modifying the core culture. The corporate parameters comprise of vision and strategy, leadership and people, processes and organizational structure. When addressing vision and strategy the objective is to achieve a clear picture of the future culture, align it accordingly, and enable leadership to communicate the future vision and strategy. Managers need to help stakeholders understand the cultural journey by cascading a compelling change story with innovative communication formats. Enabling leadership and people to understand and adopt new behaviors is key when bringing new values to live. Through practical formats employees see and feel the new world—the Capgemini Applied Innovation Exchange is a suitable format to “feel the future.” Corporate culture must be anchored in the processes and organizational structure. A network of multipliers (e.g., change agents) can support the implementation of new ways of working. Organizational structures can facilitate (interdisciplinary) collaboration and prevent silo-thinking. 2. What is Digital Culture? In Phase One of the culture transformation project, an assessment is performed throughout the organisation to ascertain which digital dimension is strong and which dimensions require advancements. The focus lies on the latter. Innovation and learning—A digital organization requires a setting that fosters creativity and rewards employees who are eager to try out new things. The organization should be open to new ideas and be unafraid of making mistakes and celebrate failures. Leadership should introduce a platform where employees present their new ideas on a regular base. Predefined processes are needed when it comes to implementing new ideas. Otherwise, great ideas fall into oblivion and employees are discouraged to generate new ideas. Some organizations have a CINO or CITO (Chief Innovation Officer or Chief Technology Innovation Officer) who facilitate processes and implement new ideas. 3. How to Design a Culture Change Journey? Based on the results of the Digital Culture Assessment (DCA) we directly address the areas for improvement within the corporate parameters. Only by changing the corporate parameters, will the core culture change. When drafting a project plan for the culture transformation rollout, proven and innovative accelerator methods ensure a sustainable and successful digital culture transformation. For example, we fostered new ways of collaboration with a Digithon for an energy supplier where the client trainees developed a new learning app for more customer orientation. Would you like to assess your own digital culture? Try the short version of the Digital Culture Assessment (DCA) and receive an individual report.